Just clears cached content. No hassle. The Cloudflare purge plugin uses Cloudflare's API to clear the cache for the URL in the currently opened Chrome tab. The extension has the ability to purge the entire cache for the current domain. It also has the ability to provide information about the caching status of the current URL and tell the location of the Cloudflare node that serves the cached contents. It provides an option to purge multiple URLs at the same time using the options page. 2. Right click on the plugin and open the options page. Fill in your Cloudflare account e-mail and API key. 3. 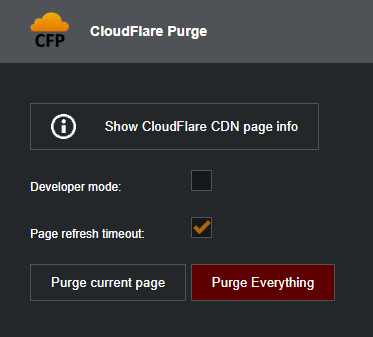 Open a page of your Cloudflare enabled website in a Chrome tab and click the "Purge Cache" button. The plugin will clear the page from the cache. 4. You can purge the entire cache with the "Purge Entire Cache" button. 6. You can purge multiple URLs at the same time from the options screen. Just right click on the extension icon and select "Options" from the context menu. If you find an issue with the extension, you can submit it on project's GitHub issues page. If you want to improve the extension with a better UI or a new functionality, please clone the master branch and submit a pull request with your changes and improvements. If you want to propose new features, please do so on the Chrome Web Store support page here. v 1.4.3: Masked the API key input. Fixed issues with the parsing of second level domains in the URL. v 1.4.0: Changed the design to reflect the new CloudFlare design guidelines. Refactored the extension code and optimized the API calls. v 1.3.4: Fixed an issue when trying to clear an apex domain. v 1.3.2: Added a new "Info" button that shows the Cloudflare node, Ray ID and the current Cache-Control header values. v 1.3.1: Pushed a fix for a bug related to anchor links with spaces in the URL. Thanks to "solarroger". v 1.2.2: A small bug fix for the refresh functionality caused by auto updates. v 1.2.1: Added a new refresh timeout option that delays the page refresh. v 1.0: The extension includes all the basic functionality that you need to purge the URL in your active tab. If you need to consume the Cloudflare API for your own applications, you can find the latest documentation here. This website is not related to CloudFlare and it is not promoting any of CloudFlare services.